Is your small business looking for a new software to manage your email marketing campaigns? Look no further than our review of what we believe to be the best email marketing software solutions. Find out just what we like and what we dislike about each of the products, hopefully our insights will help you with your decision. Use the reviews and buyers guide below to assist you in choosing your favourite solution. Best of luck! Use the table and reviews below to compare the email marketing software solutions that we have chosen to help you make the right purchasing decision. Constant Contact is the winner of our best overall email marketing software for 2018. It’s our favourite for a number of reasons, including its great functionality, ease of use, and stellar support system. It does everything we think email marketing software needs to do and more. Constant Contact’s pricing plans are based on the number of contacts you have, so the price will scale with the size of your business. For the lower “Email” plan, you will pay just $20/month for up to 500 contacts, but then $45/month for up to 2500 contacts. It can, therefore, get quite pricey for small businesses who have larger customer-bases. The “Email Plus” plan starts at $45/month for up to 500 contacts and scales in a similar way to the regular “Email” plan, but offers a number of additional features that may come in handy. While not exceedingly pricey, it is a fair bit more expensive than most competitors. Budget permitting, we would recommend the “Email Plus” plan for small businesses who have less than 500 contacts simply for that added functionality. The cheaper plan does pretty much everything that an email marketing software solution should do at its core, such as contact management, marketing tracking and reporting, email scheduling, integrations with popular business apps, and customizable email templates. However, the more powerful automation, event marketing, and additional storage and users of the “Email Plus” plan make it an invaluable addition to any small business. As mentioned, the support that Constant Contact offers their customers is top notch. Any issues that you may experience with the smooth-running and intuitive UI, or any bugs that find their way into your software, can be fixed in no time if you make use of the live chat or email support, or help yourself using the extensive knowledge base or video tutorials. Constant Contact is an intuitively designed software that has all the features and a great support system, ensuring the success of any small business’s email marketing campaign. Drip is our Editor’s Choice email marketing software, because it offers unmatched customizability (if you know what you’re doing) and automated workflows that will give you a great bigger picture view of your email marketing campaign. It will help you create a personalized roadmap of the process of getting contacts from initial contact all the way through to that final sales email. Where Drip falls a bit short is its price tag. While there is a free version that gives the user access to the full functionality of the software; it will be mostly unusable for the majority of small businesses as it only allows up to 100 subscribers. For between 100 and 2500 subscribers, the price jumps to $49/month; a price tag that a lot of small businesses won’t be able to afford for an email marketing software. If your small business fits that free version, then great; but we doubt there are many established small businesses out there that will have such a small subscriber-base. A feature that Drip has that may possibly be polarizing is that the email builder is fairly complex. We say polarizing because, while it allows for some interesting customizability for those who know what they are doing, beginners or light users will struggle to make it work for them. Possibly a drag-and-drop template builder on top of the current would be a nice touch to make it easier for beginners or those without any real programming knowledge. All of that being said, Drip offers everything else your small business might need in email marketing software. They offer good live chat support; integration with a number of business applications; smart contact segmentation, tracking and targeting; and a list of prebuilt email campaigns that can get you up and running in no time. Drip is a highly customizable email marketing software that may require some time in setting up and personalising. It should suit any small business that wants extensive customization and has a fairly big budget. ConvertKit is an easy to use email marketing software solution that seems to make up for its lacking feature set with its simplicity. Though it doesn’t have the same bells and whistles of some competitors, the features that it does offer are powerful enough to manage any small business’s email marketing campaign. ConvertKit starts off at $24/month for up to 1000 subscribers, steps up to $41/month for up to 3000 subscribers, and then $64/month for up to 5000 subscribers. While it’s obviously up to your own business’s needs, a good portion of small businesses won’t have more than 1000 monthly subscribers; making this a fairly affordable option. 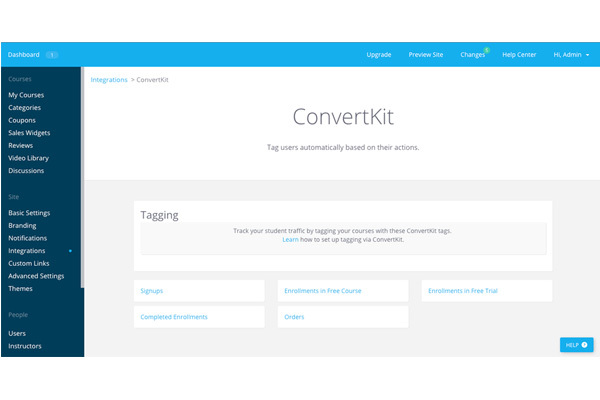 Probably our favourite feature offered by ConvertKit is the visual automation tool. What this does is help you visualize the automated email funnel (that your subscribers will be experiencing) with a simple flowchart. Each card within the flowchart displays the important information you’ll need to understand how the content in each step of your funnel is performing. You can combine that information with the intuitive “if this, then that” conditional automation to achieve better click ratios from your email campaigns; ensuring greater success from your email marketing in the long run. Though it excels in subscriber tracking and segmentation, it lacks a few other simple and more powerful features that we would have liked to see. Firstly, there is no way to customize the software in a meaningful way without delving into the API; something most beginners won’t want (or be able) to do. The same goes for the form and email template designers that are largely text-based and don’t have drag-and-drop functionality. While ConvertKit is fairly lightweight in terms of “extras”, it still has all the functionality that any email marketing software needs. Best for small businesses that have a segmented subscriber-base. ActiveCampaign is unique to our Top 5 Email Marketing Software Review in that it comes with a fully-fledged CRM in tow; provided you want to pay for it, that is. With or without the CRM and sales automation, ActiveCampaign’s works just fine as a lightweight and beautifully packaged email marketing software solution. For the sake of this review (it being a review of email marketing software), we will try as far as possible to ignore the features offered only in the plans that include the full CRM. ActiveCampaign “Lite” is the only plan that does not include the CRM software, and starts at $9/month for up to 500 contacts. From there it scales with the number of contacts your business has: $17/month for up to 1000 contacts, $39/month for up to 2500 contacts, $69/month for up to 5000 contacts, and so on. This makes ActiveCampaign a good option for those businesses with limited email marketing needs and a limited budget. ActiveCampaign has an extremely intuitive and attractive UI. This, paired with the lack of complexity and volume of features, actually make it exceedingly easy to use. Even beginners shouldn’t struggle getting used to using this software effectively. Though it doesn’t have as many features as most of its competitors, it offers just about enough to get your average small business by without any hassles. 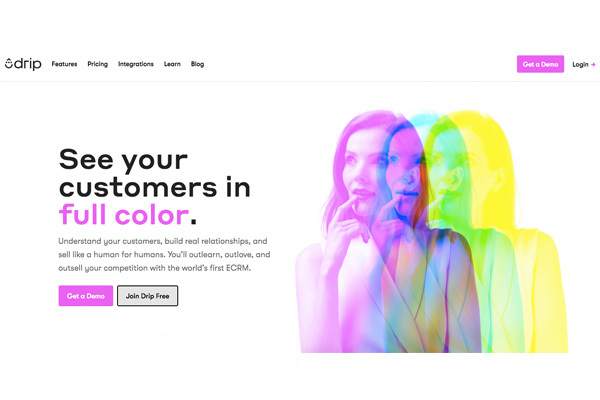 It has a great drag-and-drop email template designer, mobile apps, automatic response functionality, date-based and drip campaigns, basic subscription forms, and even decent live chat and email support. Though not ground-breaking, it certainly holds its own. 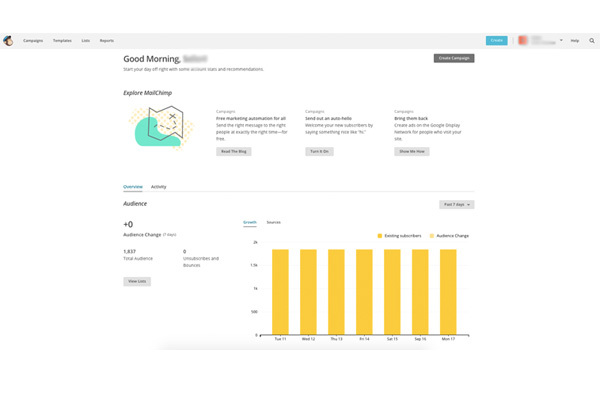 ActiveCampaign comes in a beautifully designed UI package and offers the full CRM experience, with sales automation and all. Perfect for small businesses that also need a CRM and want one that can be integrated with their email marketing campaign. MailChimp is the winner of our Best Budget email marketing software award. This is because of the free version that supports up to 2000 contacts and has enough functionality to hold its own against most paid solutions currently on the market. It’s an extremely popular solution and, with the functionality and ease of use that it offers, we can see why. Aside from the aforementioned free version with support for up to 2000 subscribers, MailChimp’s pricing system works much the same way as most do. Starting at $10/month for up to 500 subscribers, then $15/month for up to 1000 subscribers, $20/month for up to 1500 subscribers, and $25 for up to 2000 subscribers. The main difference between the free version and the paid versions is that the paid versions allow an unlimited number of emails to be sent every month; while the free version is pretty severely limited to just 12000. MailChimp offers an extensive library of webinar training videos that are an invaluable method of teaching your staff to use the software if they are new to it. Taking you all the way through setup to each of the various functions, the webinars will help your small business implement the new software in no time (and at a minimal cost). When using MailChimp, you’ll never sweat the basics. 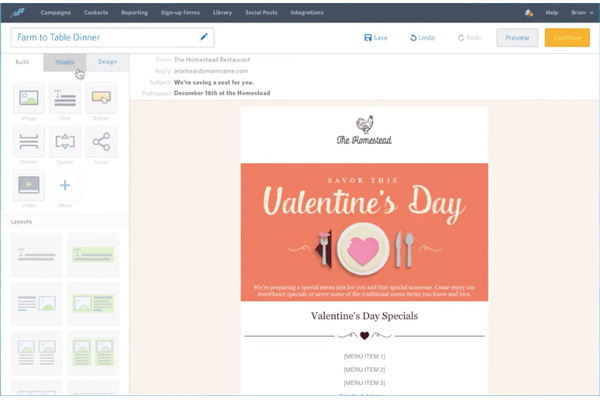 Easily create email templates and autoresponders; segment contacts into groups for better tracking, targeting and analysis; and connect with Shopify, Magento and other e-commerce applications. MailChimp has got your needs covered. MailChimp is a popular and well-rounded email marketing software solution. Perfect for small businesses looking to build a strong email marketing campaign on a tight budget. Before closing off the review with the buyer’s guide below, a couple of honourable mentions we’d like to make go to Aweber and GetResponse. If you haven’t found what you’re looking for in our top 5, maybe one of these two will suit your needs. Aweber offers a wide range of tools that cover all of the basics, and has an easy to use interface. Starting at just $19/month for up to 500 contacts, it’s also an affordable option for small businesses. GetResponse is extremely easy to use and will be a great choice for any beginners. For only $15/month for up to 1000 contacts it’s a great budget option that will run smoothly and cover any small business’s needs. If your small business is looking to revamp your email marketing campaign, then you’ll need an email marketing software. Without one you’ll be stuck designing templates, entering data and managing contacts manually; all of which can be extremely time and budget consuming. Should you not be certain as to what you are looking for in email marketing software, read this buyer’s guide in which we have detailed the main categories for you to consider when choosing. We can’t tell you what kind of functionality your own business requires, but maybe we can point you in the right direction and help you decide what will be best to cover your needs. As we will always advise any owner of a small business, budget is the biggest concern in any of your operations. Small businesses don’t have the luxury of having heaps of free cash flows that larger businesses have. You have to be careful what you spend your limited cash on. Be careful to consider your basic needs when choosing which email marketing software you want to implement, because you don’t want to pay for extra features that you won’t ever use. For example, don’t fork out $49/month for ActiveCampaign’s full CRM package if you just need email marketing software and won’t actually use the CRM functionality. Be real with yourself; though it might be fun to have all those bells and whistles, it’s probably not necessary. Ease of use of the software that you choose is important. 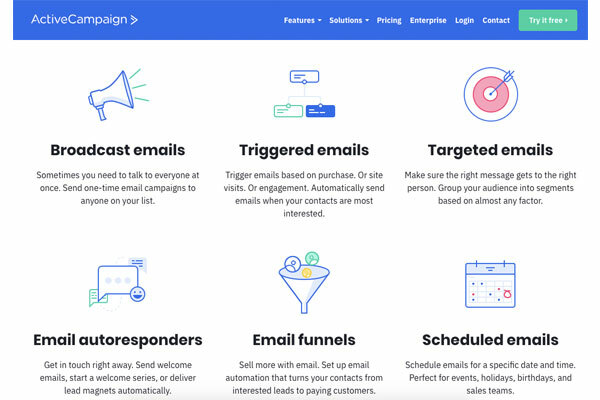 If you’re a new user of email marketing software or other business applications in general, you’ll want to choose a product that has the simplest feature set and design. It will help you implement the new software into your business far quicker and for much cheaper, as you won’t have to spend as much money or time on training the staff who are going to be using it. When implementing new technology into your business, you want it to make your life easier, not harder. Because of that limited budget that your small business is likely to have, you want to make sure that you choose an email marketing software solution that covers all of your basic needs for the smallest possible price tag. The more features you want, the more you are likely to pay. If you can cover the basics and still have cash left in your budget, then you can have a look at some of the fancier and more powerful features. How your email marketing software integrates with your other business applications is important for a number of reasons. You may have an online market place that you can create customer forms for using your email marketing software, or you may want to integrate the insights collected from your email marketing campaign into your sales and CRM software. The more your software can integrate with the rest of your business, the better. Integrations are a powerful tool, and can make your life a whole lot easier.